Kohlrabi (Brassica oleracera var. gongylodes): growing, planting, caring. Kohlrabi is a low, stout biennial cultivar of wild cabbage, and the same species as cabbage, broccoli, cauliflower, kale or Brussels sprouts. Easy to grow - actually not demanding at all ! - and a fine taste of hazelnut. There are several varieties commonly available, including 'White Vienna', 'Purple Vienna', 'Grand Duke', 'Gigante' (also known as "Superschmelz"), 'Purple Danube', and 'White Danube'. Cabbage is a biennial plant grown as an annual, with fleshy stem, ball-shaped at its base, just above the ground. This ball is white, pale green or purple. The leaves are implanted spirally all around the swollen stem. Above it they are alternate more or less serrated, provided with a long petiole. The limb has a bluish green color. Transplant kohlrabi sown under shelter after the last frosts, when they carry at least 3-4 true leaves, in open soil, in loose, fresh, moist, rich soil, in semi shade. If the soil has not been properly amended beforehand, put some compost at the bottom of the hole. Plant every 60cm. Be careful not to plant too deeply so that the ball can form well above the ground. Form a hollow in the soil around the kohlrabi and water copiously. Kohlrabi can be sown in rows starting in March for some early varieties, to July. Plant in open soil, where the earth is deep, cool, sandy and not fully exposed to the sun. Water after sowing. You may seed starting at the end of March/beginning of April under a greenhouse tent or cold frame for an early harvest. Plant the kohlrabi purchased in a bucket from your supplier after the last frost, in the ground, in loose, cool, moist, rich soil, in semi shade. If the soil has not been properly amended beforehand, put some compost at the bottom of the hole. Plant every 60cm. Be careful not to plant too deeply so that the ball can form well above the ground. Form a hollow in the soil around the kohlrabi and water copiously. 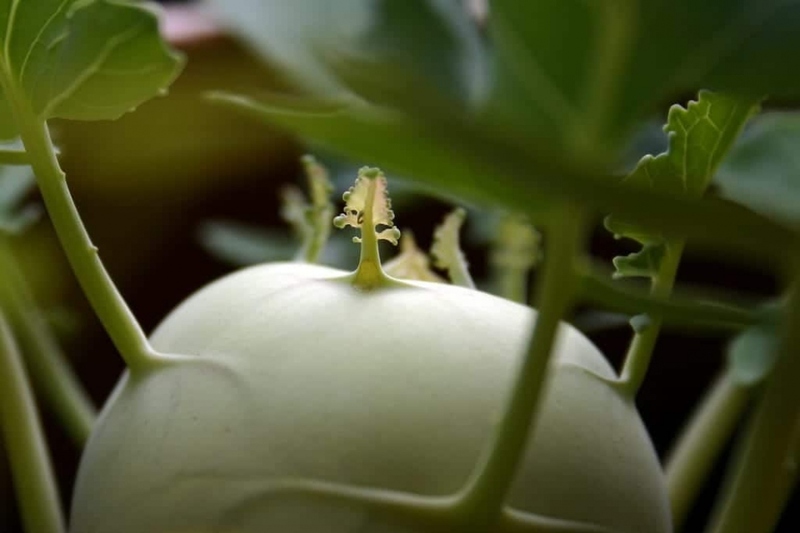 Kohlrabi is hardy and tolerates late spring frosts or early fall frosts, but in cold weather (0 to 5 ° C), the apple can lengthen, deform or produce seed. Protect it with a wintering veil if the temperature drops very low! 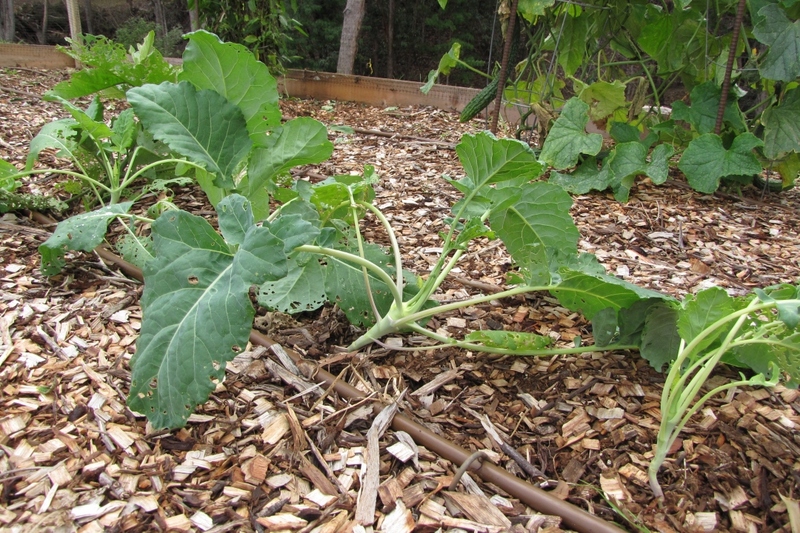 Outside of sowing or transplanting, watering is not necessary if your cabbage is mulched! If the cabbage enjoys full sun, it fears long droughts that cause a growth stop. It therefore needs to be watered. A regular growth, makes the raves tender and tasty! Watering after sowing should be done gently. Watering after planting / transplanting can be done with a spray or a watering can. Avoid to wet the leaves. Harvesting takes place from July to the first frost, when the roe reaches the size of an orange, 7 to 8 cm in diameter, about 8 to 10 weeks after sowing. Do not let it grow bigger: beyond, it becomes stringy! And also: eat the leaves like spinach! After the harvest, tear off the roots, and compost it to give way to other crops!